Pope Francis played a key role in the breakthrough between Washington and Havana aimed at restoring U.S.-Cuban diplomatic ties. Cuban President Raul Castro paid a call Sunday on Pope Francis at the Vatican to thank him for working for Cuban-U.S. detente — and said he was so impressed by the pontiff he is considering a return to the Catholic church’s fold. “Bienvenido (welcome)!” Francis said in his native Spanish, welcoming Castro to his studio near the Vatican public audience hall. The Cuban president, bowing his head, gripped Francis’ hand with both of his, and the two men began private talks. The meeting lasted nearly an hour, as the Argentine-born Francis and Castro spoke in Spanish. Francis will visit Cuba in September en route to the United States. “When the pope goes to Cuba in September, I promise to go to all his Masses, and with satisfaction,” Castro said at a news conference at the office of Italian Premier Matteo Renzi, whom he met with after the Vatican talks. “I read all the speeches of the pope, his commentaries, and if the pope continues this way, I will go back to praying and go back to the church, and I’m not joking,” he said. It was a startling assertion for the leader of a Communist country, whose crackdown on dissidents in the past had drawn sharp Vatican criticism. “I am from the Cuban Communist Party, that doesn’t allow (religious) believers, but now we are allowing it, it’s an important step,” Castro said. Castro had already publicly thanked Francis for helping to bring Havana and Washington closer together after decades of U.S. government policy of strict isolation of the Communist-ruled Caribbean island. On Sunday, he stepped up his praise on Francis’ push for the two nations to put enmity aside and work for reconciliation for the benefit of Americans and Cubans. After his meeting with Renzi, Castro expressed hope that his country would quickly see more fruits of the thaw between Cuba and the United States. “Maybe the (U.S.) Senate will take us off the list of terrorist nations” soon, Castro told reporters. Francis gave Castro a medal depicting St. Martin of Tours, known for caring for the destitute. 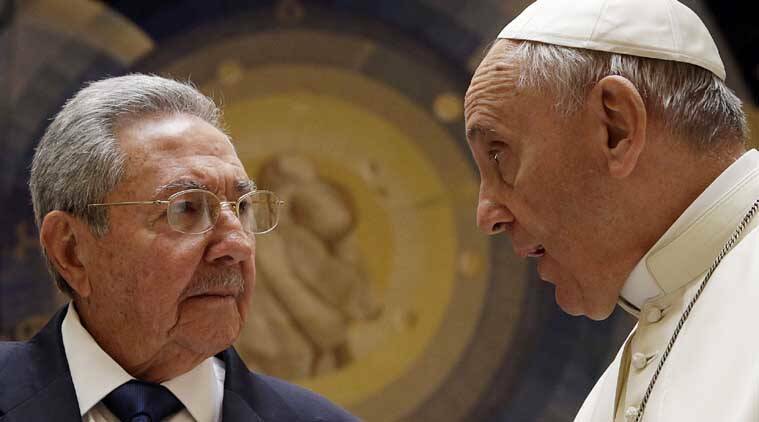 “With his mantle he covers the poor,” Francis told Castro, saying more efforts on behalf of the poor are needed. Fidel Castro met with Pope John Paul II at the Vatican in 1996. That encounter helped pave the way for John Paul’s 1998 pilgrimage to Cuba, the first visit by a pontiff to the island. John Paul was also eager for Cuba to grant more visas for foreign priests to bolster the dwindling corps of clergy on the island. The Vatican’s general policy of opposing economic sanctions as a foreign policy tool carries appeal for Cuban leaders and people, after decades under a U.S. economic embargo. With the Vatican keen on protecting the interests of its Catholic followers under Cuban Communist rule, Pope Benedict XVI also visited the island. He came to Rome on his way back from celebrations in Moscow of the 70th anniversary of the surrender of Nazi Germany in World War II.